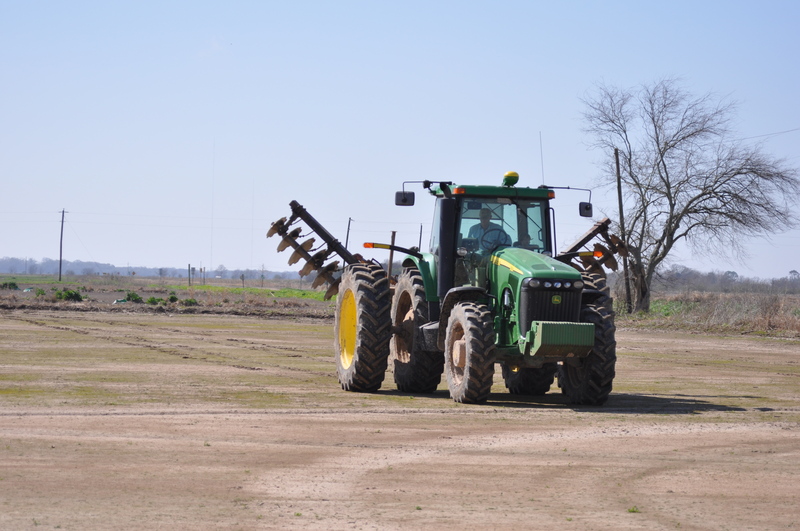 This week we’ve continued to travel the state and meet with cooperators for the LSU AgCenter rice water weevil (rww) demonstration test. In case you are a new reader to the blog, you can read more about rww at http://bit.ly/haGduU. You can also see a video on how to scout for rice water weevil adults and larvae at this website: http://bit.ly/gUJe8R. RWW are the most important insect pest of rice in Louisiana. Adults enter fields either before or after permanent flood. Injury begins when adults feed on plant leaves making longitudinal scars. If scarring is excessive the field will sometimes have the appearance of being “painted” with white paint. In some instances adult feeding can be severe enough to merit an insecticide spray before application of permanent flood. Mating commences soon after adults enter the field, but oviposition of eggs occurs after application of permanent flood. Larvae hatch from eggs, feed briefly within the leaf sheath, and then swim through the flood water to burrow into the mud and begin feeding on the roots of the rice plant. This larval feeding on the roots is the primary source of damage caused by rice water weevils when they attack the rice plant. In some cases, root pruning can be so severe that plants will fall over in the field. In other cases, root pruning in not severe enough to cause lodging, but can still significantly reduce yield. The purpose of our rice water weevil demonstration test is to compare currently recommended insecticides on commercial farms in Louisiana. This year we are restricting our test to comparison of three insecticide seed treatments (CruiserMaxx, Dermacor X-100 and NipsitINSIDE) which will be compared to an untreated check. These products were described in my last blog posting, so I won’t spend a lot of time describing them here. Yesterday we met with Farmer Charlie Fontenot, Crop Consultant Dean Reed, and County Agent Vince Deshotel in St. Landry Parish. Charlie cooperated with us last year, and his farm had the most severe rice water weevil pressure of all locations. It will be interesting to see what we find this year. Charlie intends to plant XL745 at a seeding rate of 25 lbs per acre. We will plant two passes (reps) of each seed treatment, which will be compared to an untreated check. There is a good chance that we will plan a field meeting at this site sometime later this summer. We anticipate planting in mid-March. After we completed our discussion about demo test plans, Bruce Schultz joined us to interview Charlie Fontenot for a feature story in Louisiana Farm and Ranch. Charlie was honored as St. Landry Parish Farmer of the Year for 2010. An accomplishment that he certainly deserves. Charlie has ramped up his production over the last few years and runs a beautiful operation in St. Landry. Look for the story in next month’s issue of Louisiana Farm and Ranch. Today we met with Farmer Wes Simon (and his son Ethan), Crop Consultant Rustin Gilder, and County Agent Barrett Courville in Acadia Parish. 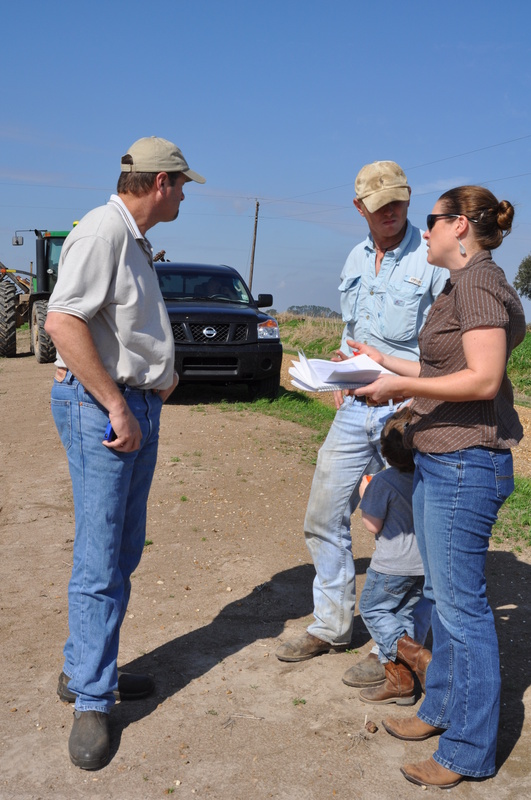 County Agent Barrett Courville, Farmer Wes Simon and I discussing plans at the field in Acadia Parish. This is our first year working with Wes and his father Glen. Wes intends to plant either XL729 or XL745 at a seeding rate of 22 lbs per acre. Wes Simon measuring out the plot size with his tractor. The planting arrangement will be the same as at Charlie’s farm – two passes for each seed treatment which will be compared to an untreated check. Depending on the weather this weekend, Wes will probably plant sometime next week. There is a good chance we will have a tour stop here in conjunction with the LSU AgCenter south farm tour this summer. After we left Wes, we headed over to Calcasieu Parish to meet with Farmer Mark Stelly, Landowner Johnny Hensgens, Crop Consultant Randy Verret and County Agents Jimmy Meaux and Dusty Zaunbrecher. 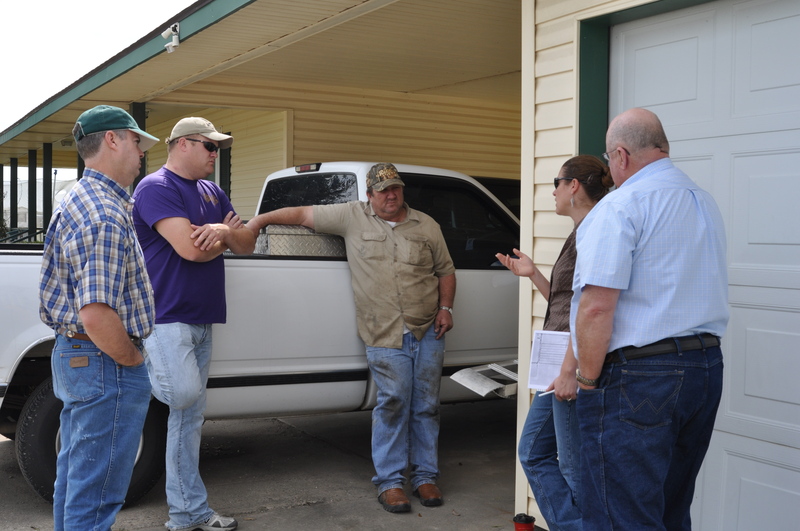 County Agents Jimmy Meaux, Dusty Zaunbrecher, Farmer Mark Stelly, and Johnny Hensgens discussing plans for the demo test site. Plans for the demo field site in this parish will be very similar to our set-up in Acadia Parish. Mark intends to plant XL745 at a seeding rate of 25 pounds per acre. Again, depending on the weather, this site will be planted sometime before early April. Now we are headed to Breaux Bridge for their annual winter rice production meeting at 6 pm tonight at the St. Martin Parish LSU AgCenter office. I’ll discuss seed treatments for rice water weevil management. All photos taken by Anna Meszaros.